Social media has been around for a while, especially when considered in the context of the fast-paced world of online marketing. In fact, it has been in existence for so long that some companies seem to be under the impression that they no longer need to make an effort with it and that the power and potential of social media has come and gone. But this could be a very costly mistake. Even though you might not be spending much time on social media these days, you can rest assured that your customers are. This means that staying up to date with your social media is an important part of keeping in contact with them. No matter how much you have in the budget for flashy ad campaigns and real time buying, the best form of marketing is always word of mouth. And social media is effectively the digital equivalent of this. It’s the sheer scale of social media that really makes the difference. More than 1.3 billion people around the world use Facebook every month. Almost sixty million tweets a day are sent on Twitter. And a quarter of a billion people use LinkedIn. In all, three quarters of the adult population uses social media, and that is not a demographic that you can afford to ignore. But what are the real advantages of using social media for your business? Gaining followers on social media is great. It’s always nice to be liked and having followers in the thousands or even tens of thousands is great news for a business. But the real key to tapping into the power of social media is using these followers to drive traffic to your business. Of the thousands of followers, what really matters is the percentage that take action and visit your site directly. So, you need to gear your social media profiles to encourage people to click through to your site. Offer promotions, spread the word about new goods and services and try and engage with your followers rather than being just a static presence. Social media offers the perfect platform to build your brand. Share information with your target audience and try and become an established authority in your desired area of expertise. Try and present a passionate and informative impression of your brand. Use the platform to push your colour scheme, logo and other branding tools. Create a visual presence that chimes with your personality, using photos and videos to build an image of your brand. Over time, these branding messages will start to sink in and help you achieve top-of-mind-awareness. Social media is also a great platform to work on your public relations and generate interest. It is a direct line into people’s lives and has become a primary source of news and opinion, so use this channel to get your name out there. Of course, the traditional press release is going to have little to no use in the social media world, but a viral video or incredible special offer is really going to get you noticed. Even if your target audience is not really the social media kind (a dwindling number of people) then you still need social media to build credibility. As a business, just as you are supposed to have a mailing address, phone line and website, you also need some active social media platforms as a general rule. It looks professional and gives potential customers a better impression of your business. An out of date or seldom used Facebook page with only years’ old status updates is not a good look for any business. To some it could suggest your business is in decline and to others it could suggest that business is booming so you no longer care about engaging with your audience. The major search engines pay attention to social media and use it to gather data and determine search engine rankings. And just as they mine your website for new and fresh content, they are doing the same on your social media accounts. So, an up to date and regularly maintained site will be a more effective SEO tool. The search engines try to present people with the most valuable search results and therefore try to promote the sites they believe are most useful to their users. So, if you have a social media site with lots of content, plenty of likes and shares, then this is going to help you to rank well. And ranking well is always good for business. Of course, there are different levels of maintaining your social media and you probably don’t have time to spend hours crafting the perfect viral videos. But there are ways of staying active without dedicating hours of your time. Keep your content short and sweet, as overlong blog posts and too much detail can put people off. Say what you need to say in the opening few lines and make sure any images are eye-catching. And try and use as many stats as you can, as people love to see them and they are easily digested. Always respond to people on social media and use calls to action to drive them to your site. Questions left hanging are bad for business and can put off others from getting in touch. Lastly, but perhaps most importantly, try and keep your social media fun. That way you won’t see it as a chore to stay on top of it and keep active. The more positive and outgoing it can be, the more successfully it will be received. As you can see, there are plenty of reasons why you need to keep your social media accounts active. Try and dedicate some time each day to add a post, reply to comments or upload some content. Make it a part of your routine and you will soon start to see the benefits. 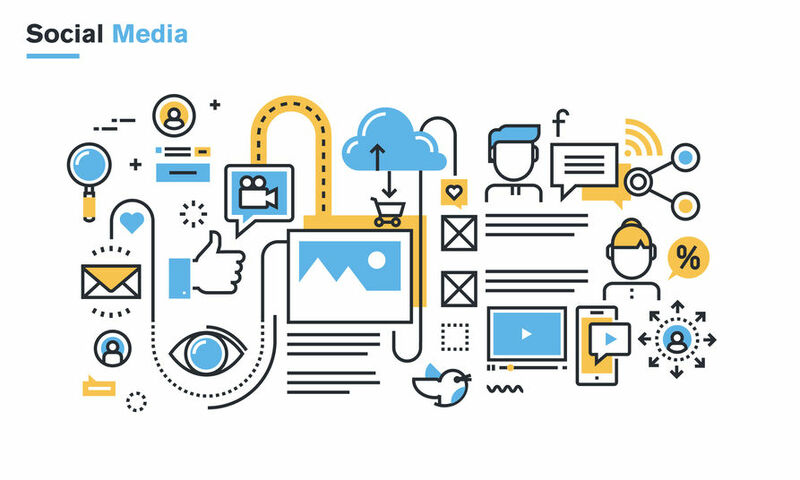 If this isn’t possible and you just don’t have the time or inspiration to keep on top of your social media content on an ongoing basis, get in touch with us to find out about our affordable social media management services. Heard of SEO – but what about SEM?